Greenhouse production of blueberries represents an opportunity for North Carolina growers to participate in a highly profitable off-season market. This project examines the potential of different genotypes for fall fruiting, and the cultural practices necessary to maximize yields in off-season production. Unfortunately, the blueberry cultivars tested were not found to be suitable for this type of production. There is a highly profitable market for blueberries in the off-season from October through April. Fruit is currently imported into the United States from the southern hemisphere at extremely high prices during this time period. 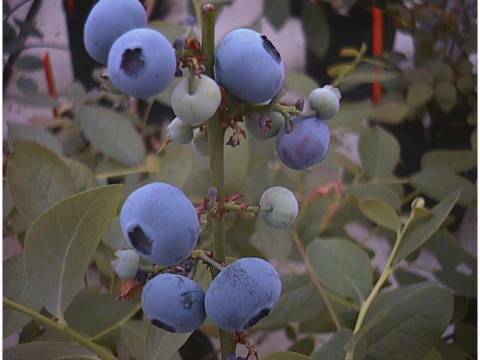 Greenhouse production of blueberries represents an opportunity for North Carolina growers to expand into this time frame. Normally blueberry plants need to undergo a yearly cycle of summer vegetative growth and flower bud development, winter chilling, followed by flowering and fruiting in spring and early summer. However, unique blueberry genotypes from the breeding programs of North Carolina State University and the University of Florida show promise for production in the off-season. These genotypes have exhibited the ability to flower and fruit in the absence of chilling (no-chill), or with exposure to a reduced chilling period (low-chill). For “no-chill” genotypes, plants are subjected to a slight drought stress, which allows them to produce fruit in the fall shortly after they have set a sufficient number of flower buds during the late summer. “Low-chill” plants have been bred to require a low amount of exposure to temperatures between 35 and 45 °F, and have therefore met their chilling by late December. The objective of this project was to examine cultural practices necessary for the off-season production of blueberries in North Carolina. Specifically we wished to: 1) Examine the fruiting potential of different genotypes for fall fruiting, and 2) Develop a protocol to maximize yield for off-season production. Experiment 1: Variety Trial. 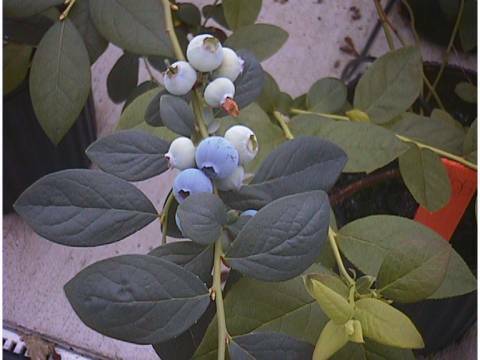 Three genotypes of blueberries (‘Misty’, NC1849, and ‘Sharpblue’) were grown in pots at the Tidewater Research Station in Plymouth, NC during the summer of 1999. In November, after adequate flower bud set was established, the plants were brought into the greenhouse. A subgroup from each of the three cultivars was subjected to either a 400 hr chilling treatment, a drought stress, or no treatment. Treatment did not have an effect on yield of any of the genotypes. However, the genotypes did vary in their yields (Table 1). Additional genotypes (NC 2625 and ‘Misty’) were added in the second year. The same treatments were applied: chilling, drought stress and control (no treatment). Plants were transferred from the lathe house or cooler to the greenhouse in December. Harvest began on 3/14 and ended on 4/27. Again there were no differences in yield due to treatment, but there were cultivar differences (Table 1). Experiment 2: Progeny Screening Trial. 185 plants from a cross between NC1849 and ‘Misty’ were grown in the greenhouses at the Cunningham Research Station. Plants were grown in the greenhouse during the 1999-2000 growing season to stimulate growth. The plants did not produce a crop that year. Yields from individual plants in 2000-1 were very low and many plants died due to disease or nutritional problems. In 2001, only 8 plants with yields of 40 or more grams/plant were identified. Table 1. Marketable yield (grams/plant) of blueberry cultivars grown in greenhouses in 2000 (Year 1) and 2001 (Year 2). Results from studies conducted thus far have not been promising, and the project was discontinued in 2003. Although there was a great amount of interest in this research, the plants did not cooperate. Blueberry plants used in this study are not amenable to production in the greenhouse.